1. It’s impossible to maintain data privacy in the cloud. 2. It’s impossible to control access to data in the cloud. 3. The cloud and compliance don’t mix. 4. 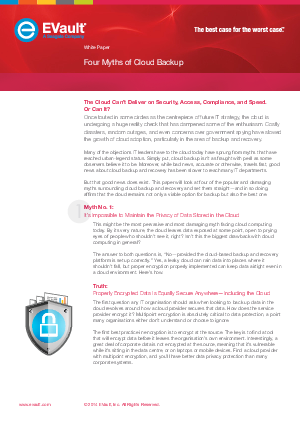 Cloud backup doesn’t provide fast data recovery. Enter your information at right, and we’ll have your white paper on its way to you in no time.